Dirt candy, fresh from the farm! This past week, I was perusing The Chef's Garden website, marveling at all the amazing and beautiful produce they grow. Their list of microgreens and various heirloom vegetables is exhaustive to say the least - and I love it! The Chef's Garden is one of the primary suppliers to some of the greatest restaurants in the country because they have SO many varieties of everything, and because the product is practically perfect in every way. Mary Poppins produce if you will. To my delight, they not only offer a CSA package, but you can purchase individual boxes as well - either ten or twenty pounds! I figured I needed to have it. I signed myself up for the delivery of a ten-ish pound box, and eagerly awaited the arrival to see what was inside. Well, to my surprise, the delivery was LIGHTNING speed! I came home from work late one evening to see a package waiting for me! I rushed in to open it, and the box nearly exploded with goodies inside! Tons of baby heads of lettuce - red romaine, redina, arugula - pounds of heirloom beets, carrots and potatoes, microgreens and edible flowers, white asparagus, beautiful young Gold Coin onions, and a mint sampler! Definitely a great investment, and I sure as heck will be purchasing more in the coming months! Seriously, I was giddy with excitement over this. Unfortunately, I couldn't cook anything right away, but it at least gave me time to think about how I could best utilize all the ingredients! The next day, I had a light bulb moment and realized I had the perfect vegetables for a classic Suzanne Goin recipe! First off, this woman is brilliant. Literally every recipe of hers I've tried blows my mind, and this is no exception. I mean, this recipe is outstanding no matter what, but I knew using these beautiful veggies would take it to another level. And it sure did! 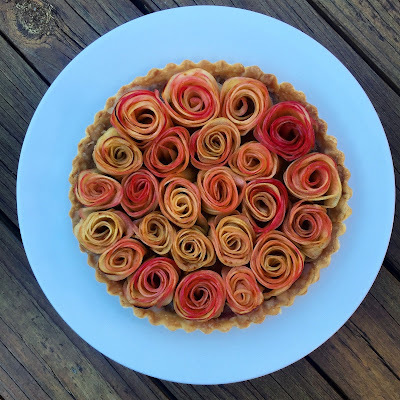 I made a few tweaks here and there and utilized all the springtime goodies that I possibly could and the results were something to write home about. Or blog about rather. Shall we? Preheat the oven to 400F. Place the beets into a roasting pan, and toss with 2 T olive oil and 1 t salt. Add the water to the pan and cover with aluminum foil. If you're using a variety of beets, be sure to put the red beets in a different section, or even a different pan than golden or white beets - the color will run and stain! But, if you're not OCD like me, you can just toss em all together to get a nice tie-dyed look. Roast the beets until tender, about 45 minutes. When they're ready, allow the beets to cool and rub off the peels, reserving for later. While the beets are roasting, prep the carrots. Peel and cut them into large chunks. Place the carrots on a rimmed baking sheet, and toss with 3 T olive oil, the thyme, and a bit of salt and pepper. Roast the carrots until tender, about 20 minutes or so. Allow to cool. Next, you can make the cumin vinaigrette! Toast the cumin seeds in a dry skillet over medium heat until just fragrant, about 2 minutes. Transfer 3/4 t of the seeds to either a spice grinder or mortar and pestle and grind away. Place the whole cumin seeds, ground cumin, vinegar and 1/2 C olive oil into a small bowl or jar and whisk or shake to emulsify. I find it's easiest to use an old small jar and really get shaking! Season the vinaigrette with salt and pepper. When you're ready to plate, begin by dressing the vegetables. If you're keeping the beets separate, you'll need to bowls - otherwise just toss it all together! In one bowl, toss the golden beets and carrots with parsley, shallots, 2 t lemon juice, and 2/3 of the cumin vinaigrette together. Add the remaining vinaigrette and lemon juice to the red beets and toss. Season both with salt and fresh ground black pepper. For the final plating, place a nice spoonful of the chickpea puree in the center of the plate - this puree is outstanding, so don't skimp! Divide the beets and carrots evenly among each plate, sprinkling each with a bit more parsley if you have it on hand. Finally, spoon a bit of the wheat berry mixture over top. Finish with a little bit of lemon zest, and dig in! So ridiculous. Every component of this dish is stunning on it's own, and put together it's really something else. 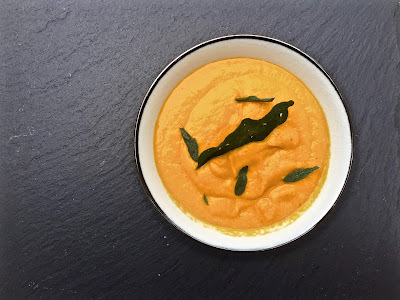 The chickpea puree has just a bit of warmth in it from the spices and is seriously addictive - it'll probably be a permanent fixture in my fridge moving forward for a quick snack! The carrots and the beets were beautiful - they both had such amazing earthy flavors that were just enhanced by the cumin vinaigrette. The wheat berries added a nice textural element to the dish, and the lemon zest finish just brightened everything with a great touch of acidity. Such a perfectly balanced dish! 3 large garlic cloves, minced - I used spring garlic! Toast the cumin seeds in a dry skillet until fragrant - about 2 minutes. Transfer to a mortar and pestle or spice grinder and grind to a fine powder. Heat 1/4 cup oil in a large saucepan over medium-high heat. Add the garlic and ground cumin, and cook for about one minute. Add in the remaining ingredients - minus the chickpea liquid - and stir to combine. Cook for about 5 minute, or until the chickpeas start to darken in color. Pour 2 cups of the chickpea liquid (if there isn't enough, just add water to reach 2 cups) to the pan and bring to a boil. Reduce the heat to medium and simmer until the chickpeas are tender, about ten minutes. Pour the chickpea mixture into a strainer over a bowl, reserving the cooking liquid. Transfer the chickpeas and 3/4 cup of the cooking liquid to a food processor or blender and puree. Slowly add in 1/2 cup olive oil and continue to puree until smooth. Taste and season with salt and pepper. Combine everything besides the sea salt in a saucepan and bring to a boil. Reduce to a simmer, and cook, covered, about 20 minutes until the wheat berries are tender. Time will vary depending on the type of wheat berries you've purchased, so just check out the package! When tender, strain the wheat berries, discarding the chile, zest, and garlic cloves. While still warm, toss the wheat berries with olive oil and lemon juice, seasoning with a bit of sea salt to taste. Wow. That's about all I can say. Love beets, love chick peas, love this! Looking at your blog has increased my "to-make" list by a large quantity. In two weeks, we do a recipe from another blog and this will likely be it. the crab lost his house!